Ahmad Shabery (second right) and others at a bird’s nest farm in Mukah. MUKAH: Malaysia has the potential to be the main exporter of bird’s nest to China, with negotiations between both countries on the matter in its final stage. Agriculture and Agro-based Industry Minister Datuk Seri Ahmad Shabery Cheek, in revealing this, said the country hopes to begin exporting birds nest to China in the next few months. “The discussion between Malaysia and China on birds nest trade is at the final stage and we hope that a few months from now, it will become a reality,” he told a press conference here on Monday. 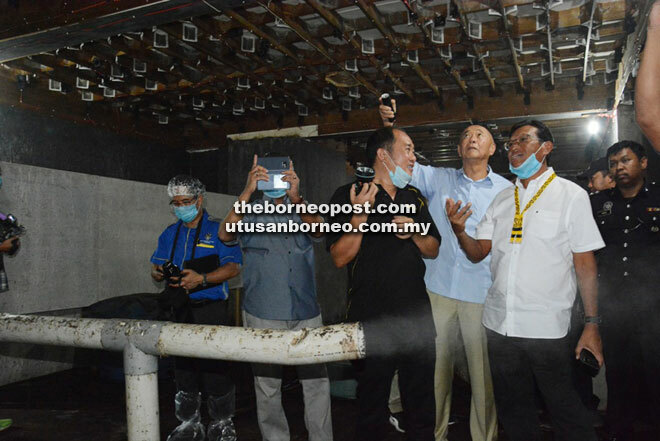 Earlier, Ahmad Shabery visited several birds nest farms, collection stations and a processing station in Mukah. He said Malaysia produced about 400 tonnes of birds nest every year, but only exported about 60 tonnes. “Many are being exported to Hong Kong, Vietnam and so forth, but eventually birds nest would be sold in China too,” he said. Ahmad Shabery also believes that if the negotiation is successful, birds nest entrepreneurs would enjoy a more stable and reasonable price for their product. Among those present yesterday were the ministry’s deputy secretary-general (policy) Datuk Mohd Sallehuddin Hassan, deputy secretary-general (development) Badrul Hisham Mohd, Agrobank chairman Tan Sri Mohamad Zabidi Zainal and Tellian assemblyman Yussibnosh Balo.